As online slots fans we’ve visited the world of Mexican wrestling on one or two occasions and this time it’s in the company of Lucha Legends, a game developed by Microgaming with some high impact wrestling moves and wild features – read all about it right here. 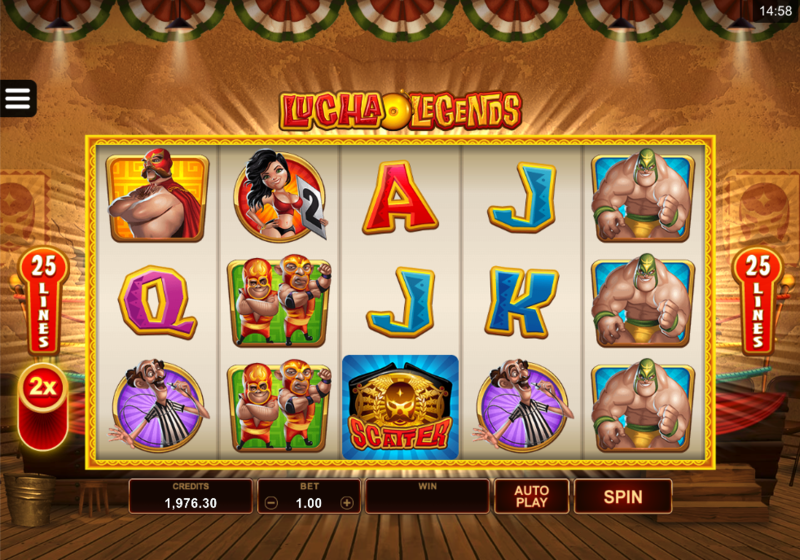 Lucha Legends is a five reel slot with three rows and twenty five fixed paylines; a stylish yellow frame surrounds those reels which float against the action-packed backdrop of a wrestling ring complete with trainer’s stool and spit bucket in the bottom left hand corner. The four highest value symbols are the wrestlers – Sal & Pepe (a duo), Burro, El Diablo and Martio – along with the ring girl and the referee; J, Q, K and A are the lower values. The wild is the games’ logo which will substitute for all others to help form winning combos except for the golden belt scatter symbol; the wild also has a feature attached which is explained below. This is triggered by landing three of the golden belo scatter symbols anywhere on reels one, three and five; you’ll receive an initial ten free spins although two or three scatters landing during this round will award and extra 1 or 10 free spins respectively. This can occur randomly in the base game and free spins and to start with you need a win which contains a wild; if you’re lucky a wrestler will then perform a dramatic move to transform that wild into a Super Wild, either creating a wild three positions wide or multiplying that win by 2x or 3x. If you’ve selected to pay double your stake for the Power Up Mode then the the wild will become five positions wide or the multiplier will be 3x or 5x. There’s plenty of colour and life in Lucha Legends and it’s a slot we’ve enjoyed playing, especially with the Power Up Mode switched on to crank up those Super Wild wins a little bit more. This game comes with an RTP of 96.38%.